The Formula 1 teams' umbrella group Fota is to investigate allegations that some teams may have overspent in 2010, according to Ferrari. Rivals have accused Red Bull behind the scenes of breaking the Resource Restriction Agreement (RRA), which puts limits on staff, spend and resources. However, Ferrari team principal Stefano Domenicali said: "I think all the teams that signed have complied." Red Bull team principal Christian Horner has denied breaking the RRA. "We've worked in accordance with the RRA limits since they were introduced," Horner told BBC Sport. "With tremendous hard work and internal efficiencies, we believe we've absolutely adhered to it. 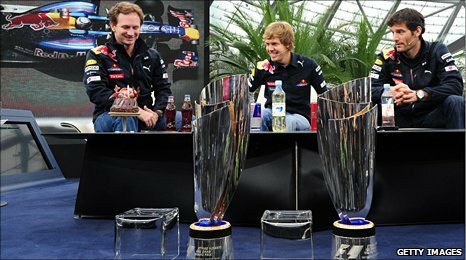 Rivals - almost without exception, I'm told - believe Red Bull exceeded en route to winning the world title last year the limitations laid out in the document that defines how teams commit their budgets. "Red Bull has committed its budgets wisely and it's obviously surprising that people will feel that way, but it's inevitable, I guess, when you're at the front and winning races." "The Formula One teams' association (FOTA) has all the tools to manage the situation," said Domenicali. "We respect the rules that's all I can say," he said. The RRA was drafted by the teams in 2009 as a way of keeping costs under control. It defines a series of limits on staffing, external spend and aerodynamic development, and a sliding scale of punishment. Domenicali emphasised that any team found guilty could not have its 2010 results changed. The RRA is a Fota-specific document, and is not part of the rules laid down by governing body the FIA, so teams cannot be stripped of results in races. But there is a sliding scale of penalties - any team found guilty of committing excessive resources has their allocation for the following year reduced accordingly, with the reduction increasing in relation to the overspend. So far, no rival of Red Bull has publicly said they believed the world champions had broken the agreement. But one senior insider at another top team told BBC Sport he thought Red Bull had "flouted" the RRA. Horner responded by asking rhetorically how they would know. Red Bull have now submitted their accounts to Fota, and Horner said he expected them to be challenged. "We expect other teams to potentially challenge [whether we have overspent] as they have done on front wings and ride heights and everything else in the course of last year, " added Horner. "But we don't have any issue. "Red Bull probably has the third or fourth biggest budget in F1. We spent prudently and have achieved great efficiency within the factory, and we have to top that in 2011." Virgin Racing chief executive officer Graeme Lowdon said it would be "disappointing" if a team had broken the RRA. "On something as fundamental as this, on something that's there to make the whole business you're in sustainable, if someone was to even breach the spirit of that, then that's extremely disappointing," said Lowden. "I cannot see how anyone can level a criticism at an RRA. If it made a worse show, or watered it down, then there would be a case to answer. But it doesn't so it's very disappointing if teams ignore something as fundamental as this." The teams are currently engaged in negotiations aimed at renewing the RRA and extending it until 2017 - the current one runs until 2012. Red Bull have been accused of blocking the signing of the new document. But Horner says he is simply trying to ensure it is "fair and equitable". "The RRA is a positive thing for F1," he said. "I think a solution can be found for the outstanding issues, it just needs some sensible discussion between the teams, because the thought of an unrestricted spend in F1 is unpalatable for all the teams. "So it is a matter of achieving transparency and a fair and equitable system between all independent and manufacturer-owned teams so that no party is at an advantage or disadvantage." Domenicali revealed that he thinks this year's 20-race schedule is the "right number", but he favoured limiting the spread of races to just one per country. He also commented that adjustable rear wings and softer Pirelli tyres this coming season will mean that qualifying is unlikely to be as important in 2011 as it was last year.